UPDATED: The Court of Criminal Appeals has ordered a new hearing in the case of Marcus Druery to determine whether he is mentally competent to be executed. The Texas Court of Criminal Appeals on Wednesday sent the case of death row inmate Marcus Druery back for new hearing in a Brazos County trial court to determine whether he is mentally competent to face execution for the Aug. 1, 2002, fatal shooting of a 20-year-old man. The Texas Court of Criminal Appeals on Friday granted a stay of execution for Marcus Druery, who was scheduled for lethal injection on Wednesday. Druery's lawyers argue that his severe mental illness has rendered him incompetent to be executed. They sought a stay of execution from the state's highest criminal court after Brazos County state district Judge J.D. Langley denied their request this week for a hearing to determine whether Druery was competent to face execution. "Executing Mr. Druery, who lacks a rational understanding of his punishment, would stand in clear violation of the Constitution," Kate Black, a staff lawyer at the Texas Defender Services, who represents Druery, said in a statement. "We are hopeful the court will find that Mr. Druery is entitled to a full and fair hearing to present the evidence of his severe psychosis." Lawyers for death row inmate Marcus Druery filed a request with the Texas Court of Criminal Appeals late Wednesday for a stay of execution for their client. They argue that executing Druery, who has been diagnosed with schizophrenia, would be unconstitutionally cruel and unusual punishment. On Wednesday, the trial judge in Druery's case, J.D. Langley, also unsealed the inmate's medical record from the Texas Department of Criminal Justice. Among the records is a report from a May 2012 examination by Dr. Diane Mosnik, a neuropsychologist who wrote that Druery "suffers from severe, active psychotic condition, meeting criteria for a clinical diagnosis of schizophrenia." The severity of his mental illness, Dr. Mosnik wrote, prevents Druery from having a understanding that he is going to be executed Aug. 1. "Although he has a factual awareness that an execution date has been scheduled for the crime for which he was tried, he does not believe that he will be executed because of his illogical, fixed, and firmly held delusional belief system," she wrote. The request for a stay follows the denial earlier this week by Langley of Druery's request for a hearing to determine whether he is competent for execution because of his mental condition. Brazos County District Court Judge J.D. Langley on Tuesday denied a motion to hold a full hearing on the claims of Marcus Druery's lawyers that he is incompetent for execution because he is severely mentally ill.
Kate Black, who represents Druery and is a staff attorney at the Texas Defender Service, said that the convicted murderer does not have a rational understanding of his upcoming execution and the she was disappointed with the judge's decision. “Mr. Druery’s execution would violate the Eighth Amendment’s ban on cruel or unusual punishment because he suffers from a psychotic disorder that renders him incompetent to be executed," Black said in a statement. "The State’s own mental health professionals have diagnosed him as schizophrenic, noting that he suffers from delusional and paranoid thoughts and auditory hallucinations." Black said Druery's lawyers will appeal to the Texas Court of Criminal Appeals. Druery is scheduled to be executed Aug. 1. Druery was sentenced to death in 2003 after his conviction in the murder of Skyyler Browne. Druery, along with two teenagers, drove Browne to a pasture. Druery shot Browne repeatedly, took his cellphone, cash, pager and a bag of marijuana and set his body on fire before tossing it in a stock pond. Browne's body was found two weeks later. The two teenagers were not charged in the crime. Since 2009, Druery has been in and out of the Texas Department of Criminal Justice's Jester IV unit for psychiatric treatment, and staff members have diagnosed him with schizophrenia with “psychotic, delusional symptoms.” He refuses to take anti-psychotic medication, because he doesn’t believe that he is mentally ill and worries that the medicine contains poison, Black said. In hundreds of letters that Druery has sent to attorneys, courts and others, he refers to nonexistent “settlements” and “options” that he says should have secured his freedom. In a January 2011 letter to the Texas Court of Criminal Appeals, with the subject line, “Wired Situation,” Druery told the judges that his case had been thrown out and yet people were hindering his freedom. “I’m still under wires in prison and don’t know what to do about it,” he wrote, going on to list a litany of imagined infractions and dangers, including stabbings and torture. “There is still a speaker in my cell playing continuously and it needs to end ASAP!” he wrote in closing. Despite Druery’s continued bizarre behavior, though, he does not meet the prison’s criteria for forced medication. And he is back on death row in Livingston. 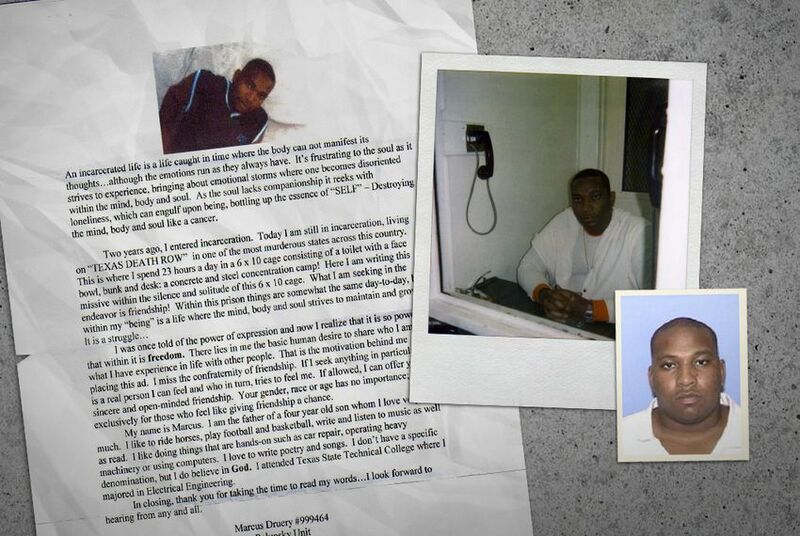 The question in Druery’s case does not concern his guilt or his sanity at the time of the crime, but rather, Black said, whether he is able to understand now why he is being executed. “He’s factually aware there is an execution date, but because of his delusional thought content, he doesn’t believe that date applies to him or that he will be executed because of a crime he’s committed,” Black said. Richard Dieter, executive director of the Death Penalty Information Center in Washington, D.C., said that although there has always been a ban on executing the insane, the courts have struggled to deal with the developing science of mental illness. “We don’t yet have a definition of what mental illnesses are so debilitating they would bar the death penalty,” Dieter said. In addition to requesting psychiatric evaluation of Druery’s mental competency, Black said, his lawyers have also asked the court to withdraw his Aug. 1 execution date. Druery’s condition, she said, has worsened as that date draws closer.